» Making donuts, or why I can’t be trusted to make good decisions. Don’t Eat Off The Sidewalk! Making donuts, or why I can’t be trusted to make good decisions. Obligatory reminder to please please please check out and enter the raffle if you haven’t, prizes and good karma await you! Even if you just pass the link around, that would be a big help. Onward! Saturday was Brian’s 29th birthday, a day which usually really excites him, but the last few birthdays have been kind of…crapped on, but we managed to have fun anyway. Two years ago, we rented a pinball machine place for two hours, ate pizza and cupcakes, good times were had. Last year, I made him mint chocolate chip cookies AND a key lime pie AND peanut butter cucpakes, and our friend Nick gave him a present that is Not Safe For Blogs, but it involved music and assless chaps. This year, Brian was not up to a party, so I decided I would make him donuts. This is kind of selfish as I haven’t had a donut in five freaking years, and we live in the home of Mel-O-Cream donuts, a midwest chain. But then I realized that he would probably be mad if I deep fried things without him, so I surprised him with a bowl of risen dough and a borrowed Fry Daddy. To back up, we started our day by going to the Farmer’s Market. No wait, we started our day by being woken up for the third day in a row of guys fixing the roof, which literally shakes our whole room, at 6:30 in the morning. Also, I took a Zyrtec. That was Bad Decision #1. 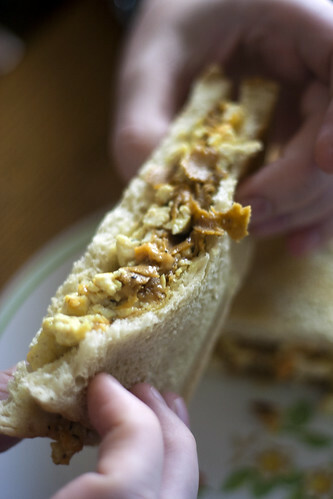 When we got home, I was already about to fall asleep, so for our post-market breakfast I threw together some tofu/daiya/tofurkey breakfast sandwiches. Then I brought my pillow downstairs, we turned on Arrested Development to drown out the banging, and I took a nap under a dog. When I woke up, the roofers were gone (it was 100 degrees for all three of the days they were up there), I felt like crap, and Brian was about to leave to have lunch with his mom. While he was gone, I made the dough, did some dishes, and cleaned out the fridge. Then he came home and with jazz hands, I revealed the surprise. Pro tip: jazz hands make everything more impressive. Since I know you’ll ask, I got the recipe from Kelly when I put the call out on google+ for vegan donut recipes. It’s from her new book so I can’t post it, but I was given other suggestions so here’s one, and apparently there is a recipe in Vegan Celebrations as well. While our results weren’t perfect, it was a learning experience. We used a plastic cup to cut them, and I think the lack of a sharp cut led to them not puffing up as much as they should. I made a coconut milk glaze (which I made a little too thin), and then I had planned to make this curd but with lime juice and zest. Then I realized I had used all of my cornstarch to make the glaze (I had to make my own powdered sugar), so I tried using tapioca flour, which…well, it wasn’t curd. I was able to thin it out with the lime juice and more coconut milk, but then when we tried to fill the donuts from the sides it leaked out. So they were messy, but delicious. Now I know that donut making isn’t THAT scary. It is gross when you smell like oil from head to toe afterwards, though. Here is where the bad decisions come into play. Thanks to the lack of sleep over the past few days and the Zyrtec, and the fact that I ate a ton of donut holes (only one whole donut, though), I took another nap and had to peeeeeeeel myself off of the bed at 6:30 to feed the dog. Fried foods and I are not friends, and the sugar rush and crash didn’t help. We went out to dinner with friends and I gleefully said, “I’ll just have the garden salad.” I felt much better after I ate a big bowl of vegetables. Then I ate another donut. Because I am STUPID. I went home and slept for eleven glorious hours. This morning, I opted to deal with the burning eyes and general crappy feelingness in exchange for staying awake. I did NOT eat the last donut.